This is the final list of conference sessions. With nearly 100,000 homes awaiting demolition in Ohio alone, demolition funding is a priority for all local government officials. This session will present two strategies for demolition funding: county issuance of demolition bonds and tax increment financing. Presenters will discuss both the details of structuring an Ohio county issuance of bonds for demolition, as well as the option of the creation of a tax increment financing program for funding of land bank activities, including demolition and rehabilitation. Demolition has many moving parts before its final outcome. The best place to start is at each individual site with an evaluation of the property, but what’s next? In this session we will summarize what we have learned and answer key questions like “What pieces of machinery and equipment should a demo contractor own?”, “Who can do an asbestos survey? ?”, “What is a good site finish? ?” and “What is timely payment??”. We will discuss whether the asbestos survey and the abatement work should be done by the same company, which work should be inspected and the importance of scrutinizing backfill. Join us in a quick moving narrative with Q and A on supervising and generating volume and quality in the demolition process. A decade into the vacancy crisis, what have the loan servicing industry and the non-profit community learned about the disposition of vacant and abandoned properties after foreclosure proceedings are commenced? What can be done to expedite the REO process, or avoid it altogether? If the bank doesn’t want the property, should the bank foreclose anyway? Are there viable alternatives to mortgage foreclosure in cases when the property has little REO value? Join a lively discussion on this and other issues with representatives of the National Community Stabilization Trust, Ocwen Loan Servicing, LLC, and Wells Fargo. The Neighborhood Initiative Program (NIP) presents great challenges and opportunities beyond demolition activities for Land Banks and community partners throughout the state. Transforming vacant land left in the wake of demolition into quality greenspace helps to stabilize neighborhoods while improving quality of life and the environment. Join members of the Cuyahoga and Mahoning County Land Banks as they share their experiences and best practices for creative land reuse. Be inspired and informed as session participants explore inventive strategies for putting your NIP greening funds to work. The presence of a historic landfill on a redevelopment site creates special challenges that should be identified and addressed to ensure that the project is successful. Ohio has seen varied redevelopment efforts at former landfill sites in the past 10-20 years. We will discuss recent case studies where redevelopment is both complete and on-going. Based on our experiences with these projects, we will discuss various issues regarding property transfers, funding, site-specific development potentials, and unique economic, regulatory, and engineering considerations. The primary objective of this session will be to identify the economic, social and ecological value of greenspace, particularly in an urban environment. Parks and open spaces provide direct and indirect benefits to residents of urbanized areas, including economic, social and environmental amenities. Over the past decade, the Trust for Public Land has undertaken significant research to document the specific benefits of urban greenspace throughout the United States. Parks have long been recognized as major contributors to the physical and aesthetic quality of urban neighborhoods. Parks and greenspace can significantly boost neighboring property values, provide ecosystem services (including natural and cultural resource conservation, improved air and water quality and preservation of biodiversity), reduce the cost of municipal services, provide healthcare benefits and play a major role in economic development and economic growth. The availability of greenspace and its interrelationship with other land uses is a critical quality of life factor in most communities. Trees and urban forests are vital to the health and sustainability of any community. While trees have been long appreciated for their contributions of shade and beauty to our landscapes, science and technology have now made it possible to quantify the environmental benefits to energy savings, cleaner air and water, carbon dioxide reduction, property values, and socio-economics. Some of the tools available that can help land bank managers understand the value trees bring to parcels as well as the surrounding community and business owners will be discussed. Presentation will be followed by a question and answer period. This session will address the need for community participation in revitalizing neighborhoods. Community outreach to local community development corporations, neighborhood groups, block clubs and community service organizations can raise community awareness and participation in both identifying problem areas and creating solutions. Case examples will demonstrate methods used in the city of Warren and in Cleveland neighborhoods to involve stakeholders in creating a new vision for vacant properties, implementing the revitalization project and maintaining neighborhood improvements. Learn about how the Cuyahoga Land Bank is partnering with other land banks on the next version of the “Property Profile System” (PPS 2.0). The Property Profile System was developed by the Cuyahoga Land Bank for tracking inventory, property maintenance, and project management. Features of this system include automatic PDF document generation, photo management, mapping, document upload, data exchange with finance system, task assignments and scheduling, and email ticklers. Modules have been developed to automate data tasks related to pre-acquisition property assessments, demolition specifications, asbestos surveys, proceed orders, property maintenance, land affidavits for tax foreclosure, and public website content. In PPS 2.0, a series of application and database building blocks that can be combined to make every land bank’s database unique have been developed. Administrative features are available in PPS 2.0 to create custom reports, fields, alerts and menus, business logic, etc. 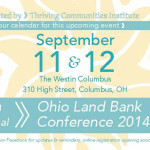 Land Banks 101 will review basic matters of governance, acquisition, disposition, blight elimination, and community engagement from the perspective of the Lucas County Land Bank, Ohio’s second oldest land reutilization corporation. This session is a must for new land banks. Land Banks & Historic Preservation: An Oxymoron? Removing blight in Ohio’s older neighborhoods might mean removing structures of architectural and historic significance. How to know? What to do? Who to consult? And all without impeding the process! This session will provide an overview of how to see places of cultural significance, where to get help and innovative strategies to make quick assessments. In addition, hear how land banks can support preservation in their toolset. As land banks look at strategies to creatively repurpose land, funding of these projects can be challenging. There may be opportunities to partner with your local land trust, watershed group or park district to create additional recreational amenities for residents and businesses. 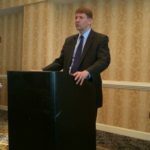 There are many state and federal sources of funding that can be utilized to finance these projects. Learn the nuances of the sources and grant administration processes required to access funds. Legal protections are also available such as deed restrictions and conservation easements that can be used to permanently protect natural resources on the land. Learn about the history of these legal land use restrictions, how they work and the nuances of stewardship. In 2012, the Port of Greater Cincinnati Development Authority contracted to manage the newly-formed Hamilton County Landbank in order to leverage the tools of both entities to build stronger neighborhoods. Using these tools, the Landbank developed REACH (Rehab across Cincinnati and Hamilton County). In this session, you’ll learn about the goals and progress of REACH to acquire distressed homes, remediate and rehab those homes and sell them to homeowners, to re-establish the private market. By concentrating blight removal and redevelopment in focus neighborhoods, Land Bank and Port Authority tools and funds can have a greater impact on community revitalization, and leverage the efforts of the City of Cincinnati, community groups and nonprofits, and private investors. Just a couple of years ago, Metro West was a 50-year-old, 1,700-unit apartment community on the west side of Columbus. Its occupancy had fallen to 28%. It was the site of a horrific fire that left 10 dead. Units and entire buildings were hopelessly blighted. Yet, a confluence of circumstances presented the opportunity to right the fortunes of the community. Today, Metro West is known as Havenwood. Seven hundred blighted units are gone. In their place is a 2.5 acre park and 7 acre development site situated across from entrance of the Hollywood Casino Columbus. And new ownership is engaged in a massive redevelopment of the remaining units. This session will explore how the Central Ohio Community Improvement Corporation played the cards dealt it by others, all with a view to harnessing the underlying market to mitigate the costs of a multi-million dollar intervention. Administrators of the Neighborhood Initiative Program (NIP) will discuss the history of the program, the importance of greening of targeted properties and the options available for disposition of properties following demolition. Potential expansion of this initiative will be discussed. Participants will have ample time to ask questions about all aspects of the NIP program. When county land banks, community development corporations and local governments are faced with the necessity of removing blight, repurposing properties and revitalizing communities, funding is always an issue. This session will provide information regarding the use of tax credits in funding local projects. Participants will learn the basics about tax credit financing. Case studies will provide examples of how tax credits have been successfully utilized throughout the state. As mortgage foreclosure and property abandonment have led to depressed home sale prices in many Ohio communities, traditional real estate development approaches have become more difficult – resulting in many communities reluctantly embracing demolition as a more financially feasible solution to blight and nuisance abatement. Community Development practitioners are becoming increasingly aware of two things: 1) models of rehab that worked in the past may not work now, and 2) approaches need to be tailored to the needs and conditions in local real estate markets. This session will look at the importance of aligning solutions to markets, and will present some of the latest thinking on the feasibility of housing renovation as an alternative to demolition. This session focuses on Slavic Village Development’s Neighbors Invest in Broadway program, a for-sale modest rehab program that has been developed to take advantage of free or low-cost vacant homes and the buyers’ own resources, including sweat equity, to get homes rehabbed and occupied with an affordable scope of work with no public subsidy. The strategy will be reviewed in detail, including property acquisition, application process, scope of work, transfer, agency protections, results, and lessons learned. This strategy is particularly effective in combination with a county land bank. This session will focus on using hemp to create a potential billion dollar industry through urban renewal, manufacturing, and retail opportunities. We will discuss the advantages of how hemp can be used to boost economic development and address social and environmental concerns that vacant land and properties in cities across Ohio face today. These developments can leverage existing public and private non-profit partnerships, and community programs to promote urban farming with this highly sustainable resource. This will also help address urban decay and has the potential for job creation and teaching sustainable life skills using best practices in all areas of hemp production. Join us as we discuss greening the rust belt and brownfields for a better Ohio. Limited funding for reduction of blight within our cities requires a strategic approach to demolition and rehabilitation within neighborhoods. The first step is an accurate inventory of the housing stock – including occupancy status and condition of the property. Thriving Communities Institute has completed inventories in the cities of Lorain, East Cleveland, Akron, Oberlin and several Cleveland neighborhoods. This session discusses the planning, implementation and results of these inventories and how other municipalities could benefit from a property inventory. Many urban communities are faced with growing inventories of vacant land. The cost and logistics of maintaining vacant land can become a significant burden, particularly for sites that are likely to remain vacant for the foreseeable future. This session will focus on topics of management and stewardship including how to select committed community partners and how to design vacant land reuse projects in ways that minimize long-term maintenance requirements. We’ll also discuss standard landscape practices that don’t apply well to vacant parcels and tackle the importance of having a long-term strategy for vacant land management, reuse, and redevelopment. We’ll also invite session participants to share experiences and challenges from their own communities. The challenges of mortgage foreclosure, property abandonment and revitalization are complex and touch a wide range of municipal and county departments as well as land banks and their community development partners. Cuyahoga County has experimented with an innovative approach that brings together city agencies, county departments, community development corporations, inner-ring suburbs, the Federal Reserve Bank of Cleveland and the Cuyahoga Land Bank – all collaborating to share strategies and best practices, brainstorm on new emerging issues and make sure the local system is ‘firing on all cylinders’. The vehicle they set up for this is VAPAC – the “Vacant and Abandoned Property Action Council”, which has been meeting monthly since 2005. This session will outline the purpose of VAPAC, its structure, membership, staffing, activities, funding, the challenges it has faced and the results it has produced.